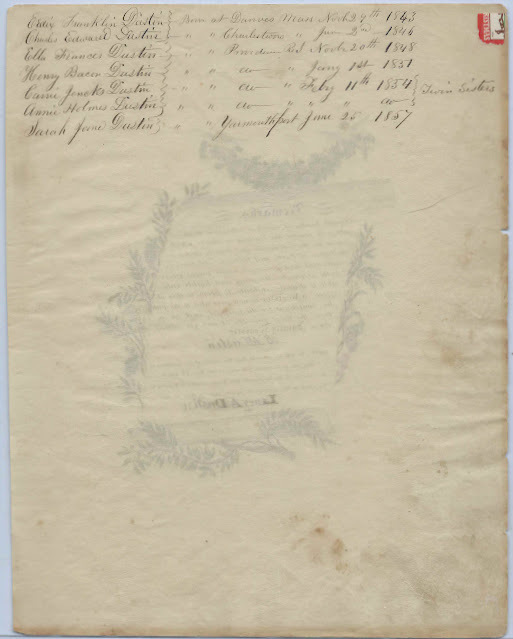 Family Register of Benjamin Franklin Dustin and Lucy Ann (Farnsworth) Dustin of Massachusetts and Rhode Island. Approximately 9-1/2" by 7-3/4". It seems like a handout advertising a company's blank family registers, which the Dustin family then used as its own register, with the names of B. F. Dustin and Lucy A. Dustin on the front and the names of their children on the reverse, along with the places and dates of their births. Whether or not, Benjamin or Lucy inscribed the names on the reverse, I don't know. The names on the front are printed, whereas the names on the reverse are in cursive. The colored designs on the front appear to have been hand-painted, as far as I could determine from a pocket microscope, so it's possible that the register and the listing of the births are from the same era. The reverse has the remains of what appears to be a more modern Christmas seal in the upper right corner. Benjamin Franklin Dustin was born December 20, 1812 at Bradford, Vermont, son of Nathaniel and Jerusha (Murch) Duston. Lucy Ann(e) Farnsworth was born January 8, 1821 at Bolton, Massachusetts, daughter of Obadiah and Abigail (Fairbanks) Farnsworth. The marriage record of Benjamin Franklin Dustin and Lucy Ann Farnsworth indicates that they were both living at Bolton, Massachusetts at the time of their marriage of June 9, 1842. Note: Many online trees have Lucy's birthplace as Boston, Massachusetts, presumably from a misreading of Bolton as Boston on the original record. The 1860 Federal Census shows the Dustin family living at Yarmouth, Massachusetts; Benjamin was working as a peddler. 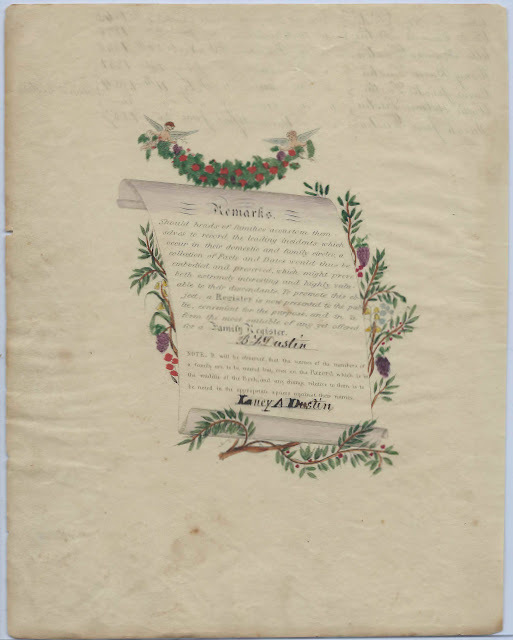 On December 18, 1861, Benjamin Franklin Dustin enlisted in the Maine 1st Light Artillery Battery. Sadly, he died at New Orleans, Louisiana, on August 28, 1862, at the age of 49 years, 8 months and 27 days. Lucy subsequently applied for a Civil War widow's pension. She died in Rhode Island on October 15, 1886.